If you're looking for the CAS Monday card just click here or scroll down. 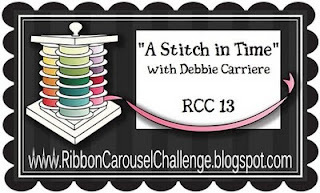 I wanted to try to get in (just under the wire) the Ribbon Carousel's "A Stitch in Time" challenge to use stitching on your card. The challenge is hosted by Debbie Carriere! You probably recognize this fab stamper from the Gallery Idol competition. Here's my take on the challenge. I need a gift card holder for a wedding shower so decided something blue was just the ticket. A bit vintage, a bit modern, a touch of ribbon. a sweet Petaloo flower and alot of stitching! I got brave and entered this in a couple of the Dirty Girls challenges on SCS as well. Have you gotten dirty yet? This is very pretty. Thanks for joining us this week at Pattie's Creations. I LOVE the scalloped flap on this gorgeous gift card. What a beauty!! Absolutely gorgeous, Charlene...I love, love, love the colors and how you used the doily...you do such awesome work!!!! super gorgeous...the design...the color...the doily...the ribbon...everything. This is beautiful. I've never made a gift card holder, but this is so spectacular you've inspired me to do so! Love it. Thanks for joining us at Pattie's Creations Design Challenges this week. What a pretty colour combo and the stitching looks so nice. The ribbon and doily fit in perfectly alongwith the flower. Very pretty! Thanks for playing in our 'STITCHING' Challenge #27! Charlene, this is absolutely beautifuL!!! Love the colors and design! Thank you so much for the shout out :) Thanks for joining us at The Ribbon Carousel!